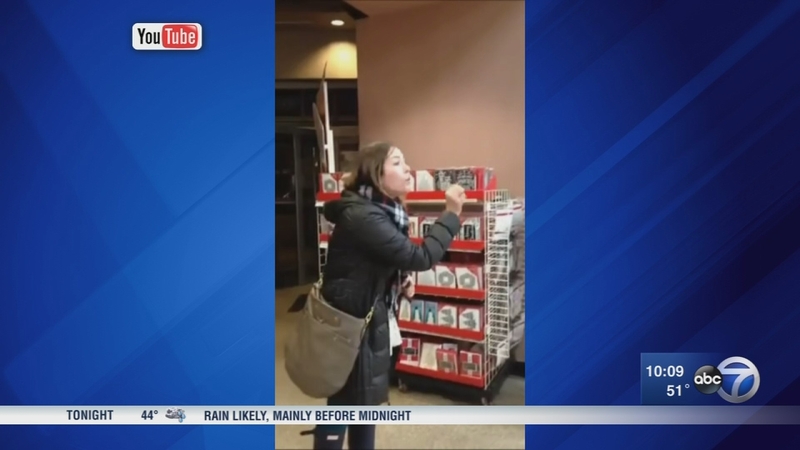 CHICAGO (WLS) -- The Michaels customer whose racially charged tirade inside the Lakeview craft store was captured on cell phone video and quickly went viral was reportedly attacked by a man in front of her former home last week. Ramiz Bajwa, 29, was arrested in the 800-block of West Cornelia Avenue on Dec. 20 for battery, according to the Chicago Police Department. The woman told police that Bajwa pushed her while they were both entering the apartment building, calling her racist, the Crime in Wrigleyville and Boystown Blog reports. The case was dismissed with the ability to reinstate charges after the woman did not appear in court, according to the Circuit Court of Cook County. Bajwa was also arrested in November for cannabis possession and driving on a suspended license, police said. Police said the woman was not injured in the attack. The woman made headlines in late November after her rant, which was laced with profanity, insults and homophobia, went viral. The woman addressed employees and customers in the store, at times yelling, for nearly 20 minutes. Jessie Grady videotaped most of it on her iPhone. "The situation got so out of control, and the thing is people need to see this," Grady said. The argument began between the woman and a store employee, apparently over a $1 reusable shopping bag. Eventually, she directed her ire at the store manager, who is not seen in the video. The woman claims she was being discriminated against and that the video doesn't show the whole story. "I just thought it was disgusting, I wanted someone to take her out of there," said Martha Spalding, a customer who was there. "She wasn't seeing these people as human," Grady said. A spokesperson for Michael's said that the company was investigating the incident and added in a statement, "We regret that our customers and team members were affected by this unfortunate incident and are grateful for the leadership of our store team in working to resolve it without further escalation." ABC 7 Eyewitness News spoke by phone with the woman in the video and she maintained she still believes she was the victim of discrimination and that the incident has been blown out of proportion. A GoFundMe page was set up for the employee who was targeted and raised over $32,000.